Another Boko Haram mass kidnapping has cast doubts on Nigeria’s claims to have virtually defeated the jihadists, putting the government under scrutiny as elections approach next year. Parallels were immediately drawn to the abduction of more than 200 schoolgirls in Chibok in 2014, which captured world attention and contributed to the ouster of Goodluck Jonathan. The man who defeated him in elections in 2015, former military ruler Muhammadu Buhari, campaigned hard on security, lambasting Jonathan’s record and vowing to defeat the rebels. Certainly Boko Haram is not as strong as it was in 2014, when it held swathes of territory across the northeast. But there is a growing sense the government’s handling of the insurgency could once again feature prominently in the run-up to next year’s vote. Security consultant Don Okereke said the Dapchi abduction, which Buhari has called “a national disaster”, was a “political game-changer”. 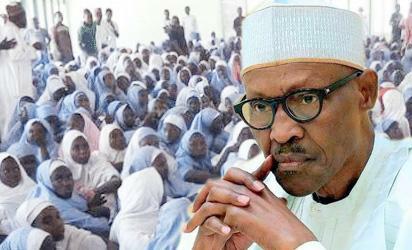 “The Chibok schoolgirls’ abduction undermined Goodluck Jonathan’s re-election bid. I think Buhari is in tow if he eventually makes up his mind to run,” he told AFP. Even before Dapchi, there were doubts about whether the government and military’s claims in the counter-insurgency matched the reality on the ground. Buhari’s declaration in December 2015 that Boko Haram, which just a year earlier held swathes of territory in the northeast, was “technically defeated” has become a familiar refrain. Yet every pronouncement has been followed by a new suicide bombing and raid. Data suggests there has been little change in extent of the violence in the last two years. On Friday, eight soldiers and three aid workers were killed in an attack in Rann, near the border with Cameroon. The UN said Boko Haram had “superior firepower” and were armed with automatic weapons, rocket-propelled grenades and gun trucks. Freedom C. Unuoha, a political scientist at the University of Nigeria Nsukka, said confidence in the government’s ability to provide security was being “deflated by repeated attacks”. Buhari, 75, has yet to declare his intention to seek a second term. Should he do so, it is more than likely Boko Haram’s supposed defeat will feature prominently in the campaign. But Dapchi casts a shadow over any gains and already, the main opposition Peoples Democratic Party (PDP) has sensed an opening it can exploit. Its spokesman Kola Ologbondiyan said Buhari and his ruling All Progressives Congress (APC) administration were responsible for the kidnapping and had given an incomplete picture. “The Buhari presidency has put Nigerians at risk by deceiving the people and issuing false performance indices suggesting that insurgents have been completely routed,” he said. Matthew Page, an associate fellow with the Africa Programme at the Chatham House think-tank in London, said Dapchi demonstrated that little had been learned from Chibok. “The Nigerian security establishment still has not fully mobilised to tackle insecurity in the northeast nor do they have a sustainable vision for safeguarding communities they’ve liberated,” he added. Dapchi can not only be seen as part of a series of setbacks in the northeast but in a wider context of security challenges across the country that are stretching the military, analysts say. In recent months, Buhari has been blamed for failing to curb a resurgence of violence in central and southern states between nomadic herdsmen and farmers. Equally, separatist sentiment from pro-Biafran supporters remains high in the southeast while the oil-rich south is still fragile after a wave of militant attacks on pipelines. Buhari’s fanatical northern support base is unlikely to be swayed by such issues but could influence voters he needs to win in key southern constituencies, said analyst Chris Ngwodo. Nigeria’s economy is limping back to growth after recession while there is little apparent progress in Buhari’s much-vaunted anti-corruption drive. The government is “desperately in need of positive news that can turn the tide”, said Ngwodo. The post Nigeria’s Buhari under pressure over Boko Haram abduction, attacks appeared first on Vanguard News.